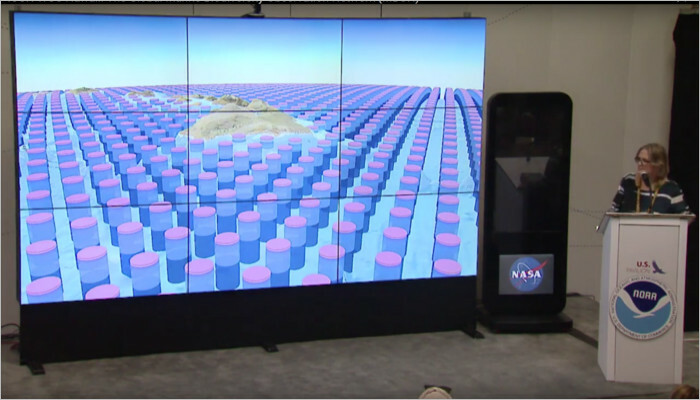 New tool to visualize marine life unveiled by NOAA Administrator. 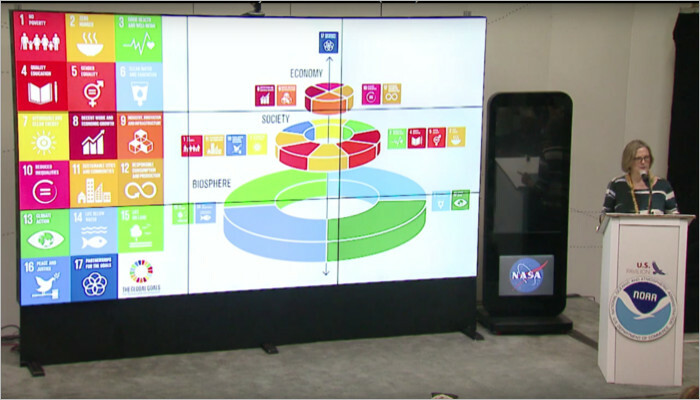 A new source of information about marine life is unveiled by the Under Secretary of Commerce for Oceans & Atmosphere and NOAA Administrator, Dr. Kathryn Sullivan, at the IUCN World Conservation Congress, September, 2016 in a NASA Hyperwall talk. A graphic representation of information in a map of Ecological Marine Units, developed through GEOBON, gives an unprecedented ability to understand data for better decisions. Dr. Kathryn Sullivan has undertaken three space flights and says pictures of the Earth are not enough to understand the man-made complications and rapid change the world is facing. For informed actions, we need a more complete understanding. Dr Sullivan’s speech is summarized here. “Satellites are fantastic tools that give us a capability to tackle these challenges, that, combined with in-situ data and careful analysis can be used to create information products, unparalleled in human history. “Countries have come together over the last few years to identify 17 Global Goals for Sustainable Development, with targets and indicators. A practical way to look at them is through a schema developed by the Stockholm Sustainability Institute. “There are three categories of goals: Biosphere, Society and Economy. On the biosphere layer you have the four goals: life in the water, life on land, clean water and sanitation and climate factors. Earth observation data of the sort we will be talking about today are indispensable for getting a handle on those drivers which are essential for a health society and a healthy economy. “Historically the biosphere category was the realm of geeky scientists, how do you get insights from the information they produce to the decision makers in these other tiers? “I lead the US contingent to the Group on Earth Observations, working to make the links of this chain for quite some time. This is contingent on global agreements for free and open sharing of the data. Any of the data that NOAA collects are free and open to anyone who can use them. “No weather bureau can make you a weather forecast without data from the entire globe. It is critical that countries measure what they can and share this underlying foundational data so everywhere, from a college campus to an entrepreneur, to a civic leader, the data are available for their use. “Organizations like NOAA put sensors such as sonar to map the bottom of the ocean, to surface meteorology through ships, gliders, flood gauges and many more to add calibration to satellite data for a fusion of usable information. “GEO came into being 10 years ago to drive sustained observing networks, to advocate for increased sharing of data and to look at the decision needs of an economist or a social scientist or someone responsible for public health, and to connect the dots. “We get a snapshot of the Earth from our sensors, we have to verify, analyze and package that information for a decision maker – that’s the value chain that connects scientific capability to societal benefit. “In GEO we have a global forest observing network, a food security initiative called the Global Agricultural Monitor, which now helps inform the famine early warning system the UN operates, and we are now turning our attention to marine biodiversity. “We are launching a new programme, the Marine Biodiversity Observing Network, or MBON, because we must take the pulse of the planet. “MBON is a multifaceted collaboration between global partners through GEO and in the US it comprises NOAA, NASA, it’s our integrated observing system network and our Department of the Interior’s Bureau of Ocean Energy Management, all working together to manage our spectacular ocean realm. “I want to present pilot projects in Florida, and Monterrey Bay in the US, where dozens of species are seen for the first time. “This is a computer model that measures ocean circulation the full depth of the ocean. The colors indicate sea-surface temperature, satellite plus other data, plus analysis, plus modeling. We can see the deviation – how unusually hot or cool is the ocean right now? This is from NOAA’s coral reef watch the colors here – warm colors show up to 5 degrees hotter than the average over a number of decades, blue show cooler. In 2015 and ’16 we’ve been having the most expansive and persistent coral bleaching event ever. “Chlorophyll is used as a proxy for phytoplankton, the living base layer of the ocean. Where you see more green you’ve got an abundance of chlorophyll, higher levels of phytoplankton, more productivity in those waters. Up flows of ocean currents bring cold rich water up to the surface, that’s where you get these glorious plant blooms. “We have those snapshots (from satellites) we have to verify the data, we have a plethora of tools and techniques that are used to do that. The only way we can measure the abundance of fish in the ocean is to go and do some in-situ sampling and apply the data to population models. “Out on reefs and in complex habitats, direct observations such as with divers are needed to take the information to the scale and specificity that we want to understand the biodiversity of the ocean. The presence, the abundance, the phenology the genomics, all the way down to the DNA level in many cases to provide the texture and meaning to make this information useful. “Then we put measurements into an analytical framework, a contextual framework, to fuse pieces together for a more complete picture. Today’s data merged against historical data and geographic scales so we can be sure we understand the time and space variation of the biodiversity of the ocean. “What elements of information does a decision-maker really need? NOAA produces 20 terabytes of data a day. People crave information, not data, that connects to the questions they’re working on and adds insight. The packaging problem is about understanding the decision framework of someone who is not a scientist. It might be a minister of Agriculture or Environment, what can Earth science add to their repertoire? “I’m going to focus on two examples. We have created an MBON Portal, where you can find this information in an accessible way. We are also unveiling the Ecological Marine Units Explorer, the ability to map globally the world’s ocean. “This is the US portal for the Florida Keys. It shows you polygons that show you fish census, many strands of data accessible through this portal. With an easy to use interface which mixes the information you need. “The Ecological Marine Unit Map shows cylinders, they are data layers from NOAA’s world ocean data atlas, 52 million data points about the physical and chemical characteristics of the ocean, at 105 depth levels: salinity, temperature, depth dissolved oxygen, phosphate, the key variables that enable life throughout the ocean. “With the EMU Map, we represent the information as disks so that you can see sideways, the red donut represents a layer that is hypoxic, that is depleted in oxygen. That’s going to be hugely significant biologically, to be able to see that over a global expanse. “This is a global framework, contains the average over the entire world ocean atlas, a 50-some year record, the team will now go back and start time slicing it, providing the ability to look at it in different dimensions, right now we have the initial framework, there is more work to do to give it more time and depth capabilities. “I want to give a shout out to Woody Turner from NASA, to Roger Sayre from the US Geological Survey, to Drew Stephens from Esri, they’re really the nucleus of the team that’s been pulling this together. “There’s a whole other data base called the ocean biology information database that’s not yet been loaded into the EMU, but imagine we can add what’s known about fish stocks and coral species. And think how fabulous it will be to continually populate and improve this with data from any expedition. “Over time we can come to a richer understanding of our ocean, and we can see the next science data to go after to make this more useful. “We’ve been working to package, not just raw data, but information, let’s remind ourselves of the societal needs that these tools and flows of data can help us tackle. “Lake Erie in the US seasonally has massive blooms of algae, often toxic algae, getting to monitor and predict this has been a tremendous step forward that NOAA and our partners have made of real societal importance. Some cities and towns draw their drinking water from the Great Lakes. And if the concentration of these poisonous bugs gets high, they could contaminate their entire water system, sicken people in their community, requiring the water system to be shut down. NOAA operates a Great Lakes forecast system that sends alerts to those water managers so they can shut the valves on the system before it gets contaminated. It is better to find an alternative way to supply water for a few days or week while the bloom is happening, than to lose the municipal water system for months. We’re talking communities of hundreds of thousands of people. “This is a good example of actionable intelligence that provides or averts an outcome, either for societal benefit or the effect on the resource. These tools don’t just enable us to manage our interface with nature for human benefit, they will help us steward and manage our natural resources more wisely. “This is the intellectual and human ecosystem that it takes to make this happen, in a parallel world to the one we live in. We’ve got cities and NGOs and utilities and businesses, and we need to do all of these things. Monitor and analyze, modeling is another form of analysis, that plus the data we now have as we take the pulse of the planet allow us to predict the weather; lake conditions; when a staple food crop is likely to fail, and an impoverished country will be in a food crisis. “This capacity to predict what’s coming has never existed before in human history, it is very novel. We are still babies learning how to make good use of it for societal benefit and resource protection. This slide reminds us how many players and partners it takes to do this. What sort of productive and constructive partnerships and communications and trust it takes to sustain this capability that we now have here on planet Earth.